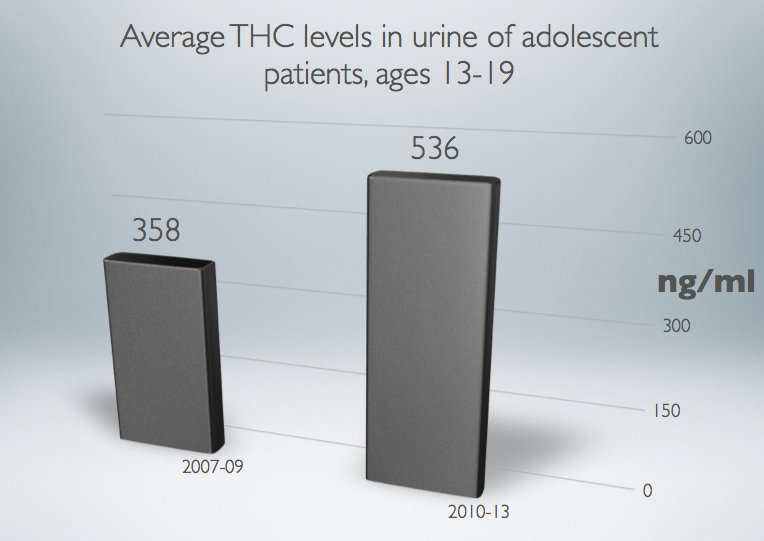 In the last several months, my colleagues and I have noticed rising levels of THC in the urine of our young patients — but the average increase I present here surprised even us. THC, which is short for tetrahydrocannabinol, is the active ingredient in marijuana that gives users a high and is chiefly responsible for making the drug addictive (yes, it’s addictive; responsible and respected scientists no longer debate this). In the last 40 years, growers have worked steadily to spike THC levels in marijuana — taking a page from the playbook of Big Tobacco, which was caught spiking nicotine and adding chemicals to make cigarettes more addictive. Marijuana’s THC levels have increased substantially in the last 40 years. In the 1960s and ’70s, marijuana’s THC levels averaged around 2 percent. Today, they easily exceed 10 percent. In medical marijuana states, including Colorado, where I live, potent strains frequently falling into adolescents’ hands top 40 percent THC. Then there’s the concentrated form of THC, commonly called hash oil, that is extracted from the plant and added to foods and drinks and inhaled through smokeless vaporizers. THC concentrate can exceed 90 percent. In 1991, 8 percent of the nation’s high school students reported past-month marijuana use. 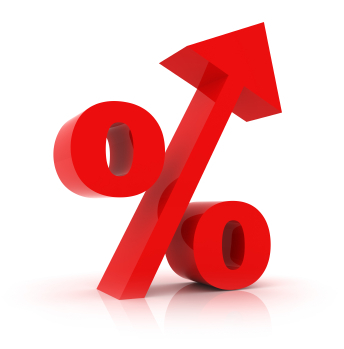 The past-month use rate reported last year was 15.5 percent. In 1991, 0.9 percent of the nation’s high school students reported daily use. Last year it was 3.5 percent. With all of this top of mind, my colleagues and I examined the results of approximately 5,000 urinalyses of adolescents treated in a downtown Denver clinic where I practice. The patients were ages 13 to 19. As you’ll see in the chart below, from 2007 through 2009, the average rate was 358 nanograms per milliliter of urine. This time period immediately preceded the opening of hundreds of marijuana dispensaries in Colorado. From 2010 through February 2013, the average THC rate registered at 536 nanograms per milliliter of urine. This time period coincides with a boom in access to, and social acceptance of, marijuana in Colorado, where voters in November 2012 approved a constitutional amendment legalizing the drug for recreational use. Young people are using marijuana more frequently, or they’re using more potent marijuana, or they’re using more potent marijuana more frequently. I suspect the third option is most likely. When young people report for treatment, their marijuana addiction is more serious. It takes longer to treat them and requires more resources to do so — which means their treatment is more costly. Typically, the more severe the addiction, the poorer the prognosis for recovery. I am increasingly concerned about concentrated THC, which is infused into an ever-growing number of edible products and pushed to users in other smokeless forms that are billed as safer and healthier to use because they don’t involve smoking. My colleagues and I also have found that these smokeless forms of ingesting THC are increasingly popular with young people who are eager to hide their drug use. It is reasonable now to question how much longer it will be before we see injection use of THC — especially as marijuana is legalized. Bahahaha injection! Really?!?! “Dr. Fool” needs a proper education! Thanks for writing, Kim. Your response is typical of those I have received, so I’m posting it. THC injections have happened in laboratory settings where researchers are examining the links between marijuana use and psychosis. For example, this video, produced by the BBC, shows a woman receiving injections of pure THC and a mixture of THC and cannabinoid. It was posted in 2011 and has received more than 106,000 views. So, THC injections aren’t implausible. Similarly, synthetic cannabinoid was developed in a laboratory for research purposes. Only a few short years later, “entrepreneurs” who studied published papers, were marketing the substance as a substitute for marijuana that would allow users to get high and also evade drug tests and, possibly, avoid arrest. Yes, there are many ways to ingest drugs that are more comfortable than injection — and yet people inject drugs. Heroin can be taken orally, snorted and smoked, but many people who use it inject it. Injection delivers a faster, more intense high, which is why it’s a preferred delivery method for some drug users. Perhaps you also should contact researchers whose studies have included injected THC. Their thoughts are bound to be interesting. Dr. Thurstone merely has reported that injection use of THC is plausible. As noted, it has certainly happened in clinical research settings. Two YouTube videos showing a woman receiving THC injections (one is posted here) have received nearly a half million views at this writing. Responsible healthcare providers should be aware of the possibility of injection THC. Communities should be aware of it, especially in Colorado, where THC injectables (meaning needles filled with THC) will be legal for sale to people 21 and older on Jan. 1, 2014. People should discuss the matter now — and not wait until it shows up in their homes, neighborhoods, schools and medical clinics. I’m a youth who goes to school in lakewood. I find it to be a joke how many other kids i see at my middle school are smoking pot. Sadly, so many of these kids are addicted. They often are told that it is not bad and that it will not hurt them, then they become addicted and fall into the vicious cycle due to the harmful effects of the frug. For all of the pro-marijuana people i would like to thank you for 1.) For screwing the youth 2.) For creating lies that deceive kids into doing this drug. If you pro-marijuana people don’t think that pot is bad then you must be high. Thanks for writing, Harrison. I’m especially interested in hearing from young people on this subject. So, if the hypothesis is that rising THC levels lead to rising use and you lament the 2% THC of the Woodstock Era, why are you only going back to 1991 to set your baseline? Isn’t that a little intellectually dishonest? The most kids smoked pot back in 1979 when it was the weakest pot. Then in 1985, fewer kids smoked pot even as it got more than twice as potent. Then in 1991, almost 1/3 as many kids smoked pot, even though it got still more potent. By 1997, twice as many kids were using even as the potency stayed relatively stable. In 2003, fewer kids smoked pot even though it got more potent, and in 2009 fewer kids smoked as the potency dropped. Pretty much everything happened except your hypothesis according to this data set. even the latest data from 2011 show 8.0% monthly use and the dabs/hash phenomenon was well underway by then. The reason we’re unfazed by your scaremongering of the urine metabolite levels of your paying clients is that all you’re finding is that the people forced into your business for violating prohibition are getting higher, not that getting higher forces people into your business. You know as well as I do (SAMSHA TEDS-A) that for every one person who self-admits to rehab solely for marijuana, another four are forced there by the criminal justice system. Colorado went and added language to the constitution that is really bad for your bottom line. 1. “So, if the hypothesis is …” That’s not the hypothesis, and I have not offered one. 2. Why did I mention Monitoring the Future data going back to 1991? This long-running survey has monitored 12th graders since 1975. However, I’m not interested only in high school seniors. I want to know about students in grades 8-12. The survey started to include 8th and 10th graders in 1991. 3. I’m simply reporting here that kids are showing up in my clinic with more THC in their urine. The higher their THC levels, the more severe their addiction. Their THC levels have risen substantially since 2007. I’m unfazed that you express no concern about the significance of this. 4. “You know as well as I do …” No, I don’t. What I do know is that marijuana abuse is the No. 1 reason adolescents are admitted for substance abuse treatment in the United States. I also know that most of my patients come to my clinic voluntarily. Few are referred there through the courts. “The proportion of admissions for primary marijuana abuse increased from 12 percent in 1997 to 16 percent in 2003 through 2007. • Nearly three-quarters (74 percent) of primary marijuana admissions were male. • Over half (51 percent) of primary marijuana admissions were non-Hispanic White, followed by 29 percent who were non-Hispanic Black and 15 percent who were of Hispanic origin. That profile is consistent with Colorado’s medical marijuana registry. It’s also important for people to understand that private treatment centers don’t often participate in TEDS. As the study states: “In general, facilities reporting TEDS data are those that receive State alcohol and/or drug agency funds (including Federal Block Grant funds) for the provision of alcohol and/or drug treatment services.” People who are court-referred are more likely to go to publicly funded treatment programs, Russ. Another important thing to know about TEDS is that it tracks admissions, or patient visits, not individuals. 5. By “added language to the constitution,” I suppose you mean Colorado’s Amendment 64. If by “bottom line” you mean the number of patients I see, you’re right. I find it very sad that my patient referrals have tripled since 2009, the start of the boom in marijuana dispensaries in Colorado and the continued era of decriminalization (public records show few people are jailed only for marijuana use in Colorado and across the nation). I am also sad that there’s so much demand for marijuana-addiction treatment now that our clinical program is having to hire another therapist, and at least one other adolescent treatment program serving metro Denver is expanding, too. I’d be interested to know whether those urinalysis results were for actual THC or for THC metabolites like 11-hydroxy-THC. Thanks for writing. Good question. We were measuring THC. (yes, it’s addictive; responsible and respected scientists no longer debate this). Please list your source for this statement. Thanks for asking. There are several studies to review, but a great place to start is the work of Alan J. Budney, a professor of psychiatry at Dartmouth’s Geisel School of Medicine. His research and reviews of the literature have focused on physical withdrawals from cannabis.